Thesis 1.The evidence is abundant, however, 2.that critics of Christianity and some Christians do not place much stock in hyperbole. 2 Thesis 1.The evidence is abundant, however, 2.that critics of Christianity and some Christians do not place much stock in hyperbole. 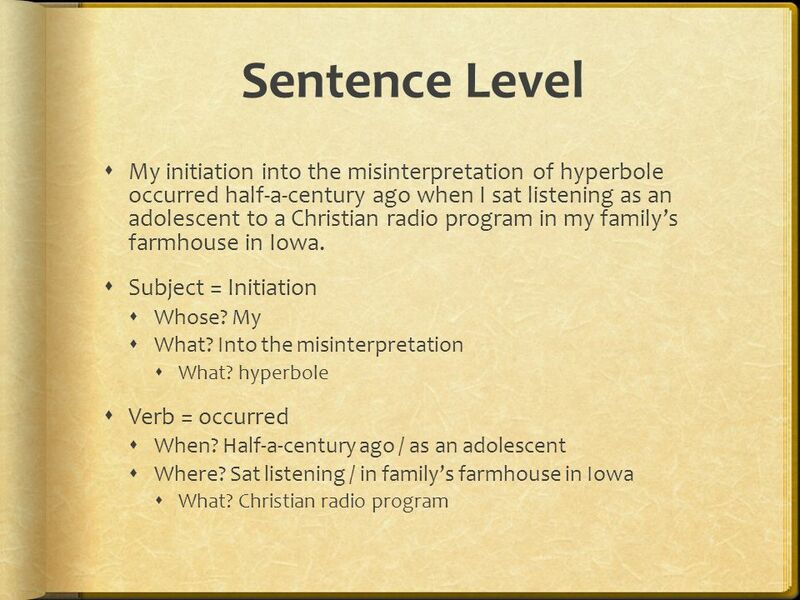 7 Introduction Paragraph My initiation into the misinterpretation of hyperbole occurred half-a-century ago when I sat listening as an adolescent to a Christian radio program in my familys farmhouse in Iowa. 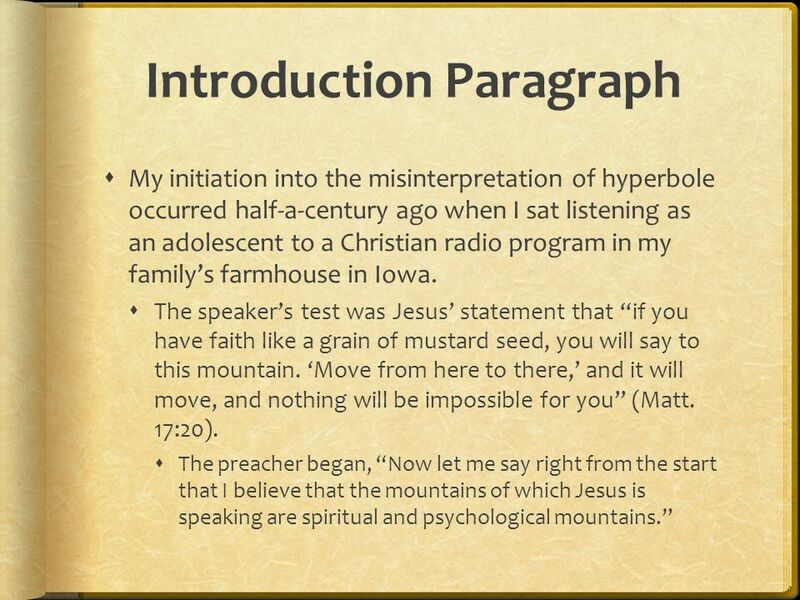 The speakers test was Jesus statement that if you have faith like a grain of mustard seed, you will say to this mountain. Move from here to there, and it will move, and nothing will be impossible for you (Matt. 17:20). The preacher began, Now let me say right from the start that I believe that the mountains of which Jesus is speaking are spiritual and psychological mountains. 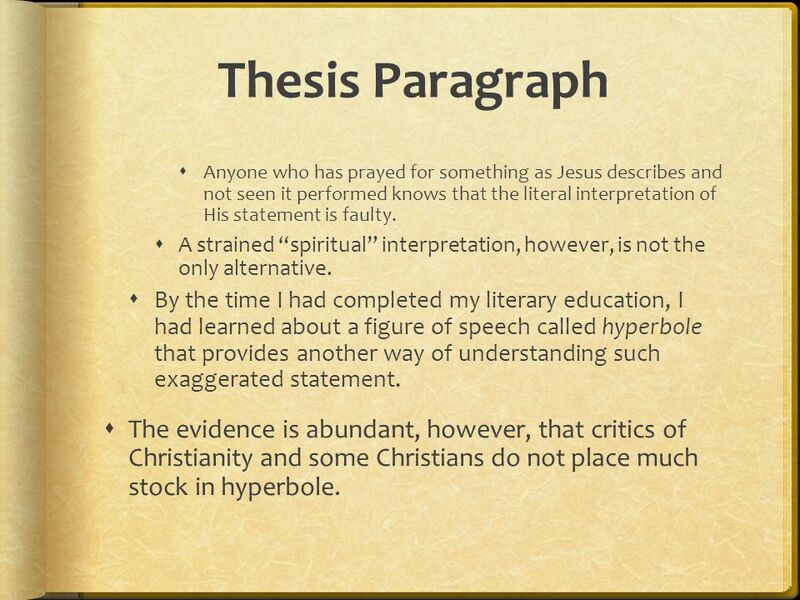 8 Thesis Paragraph Anyone who has prayed for something as Jesus describes and not seen it performed knows that the literal interpretation of His statement is faulty. A strained spiritual interpretation, however, is not the only alternative. By the time I had completed my literary education, I had learned about a figure of speech called hyperbole that provides another way of understanding such exaggerated statement. The evidence is abundant, however, that critics of Christianity and some Christians do not place much stock in hyperbole. 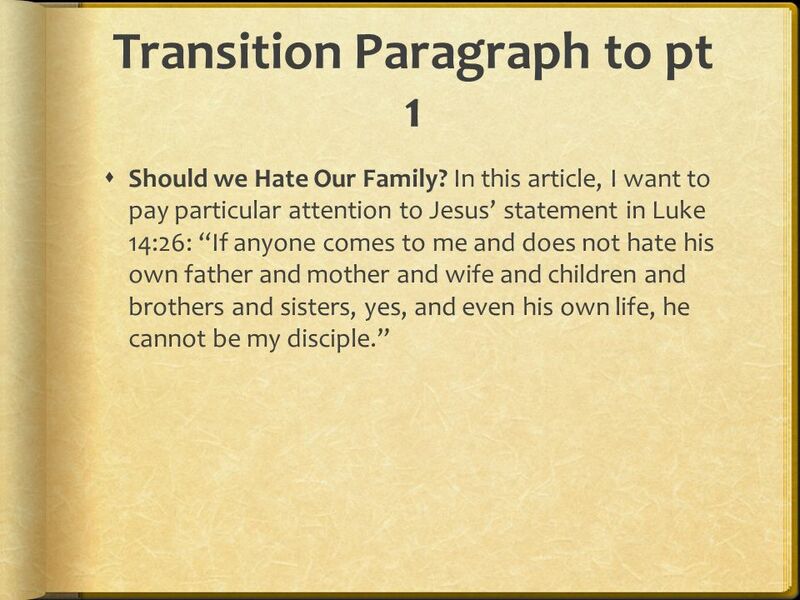 9 Transition Paragraph to pt 1 Should we Hate Our Family? In this article, I want to pay particular attention to Jesus statement in Luke 14:26: If anyone comes to me and does not hate his own father and mother and wife and children and brothers and sisters, yes, and even his own life, he cannot be my disciple. 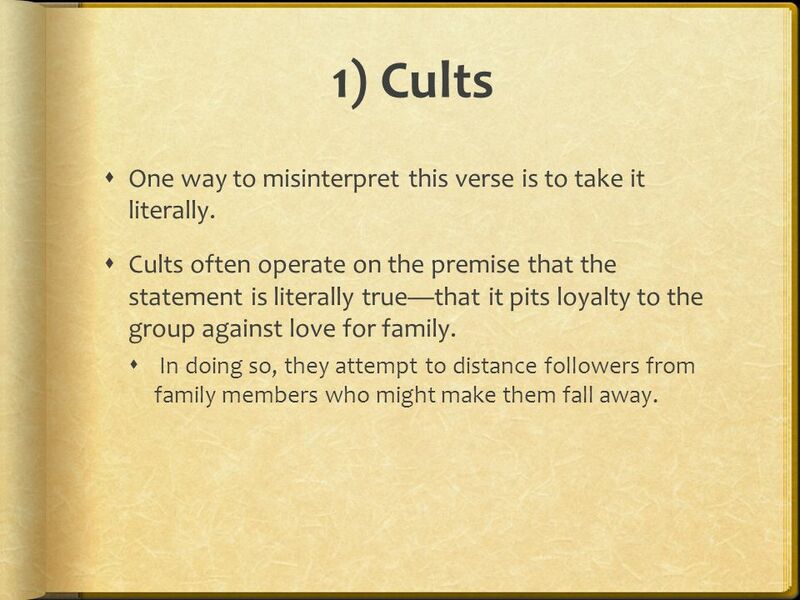 11 1) Cults One way to misinterpret this verse is to take it literally. Cults often operate on the premise that the statement is literally truethat it pits loyalty to the group against love for family. In doing so, they attempt to distance followers from family members who might make them fall away. 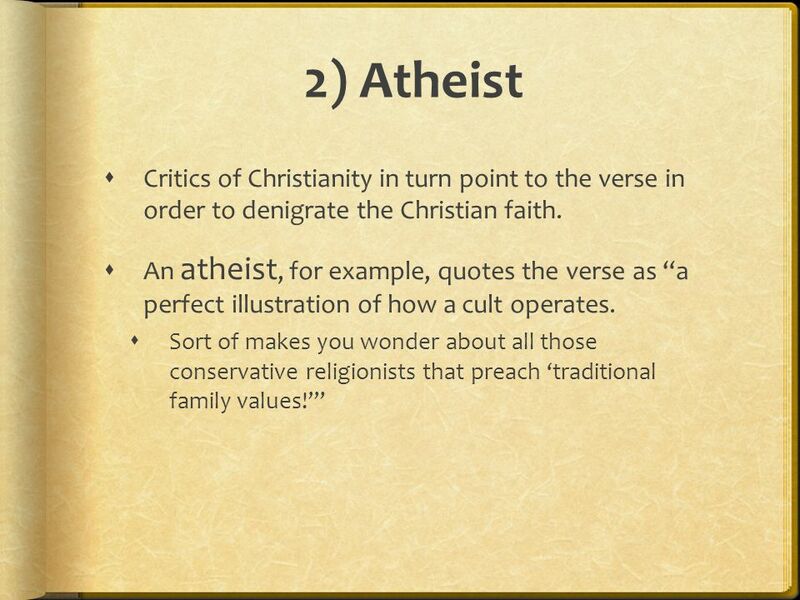 12 2) Atheist Critics of Christianity in turn point to the verse in order to denigrate the Christian faith. An atheist, for example, quotes the verse as a perfect illustration of how a cult operates. Sort of makes you wonder about all those conservative religionists that preach traditional family values! 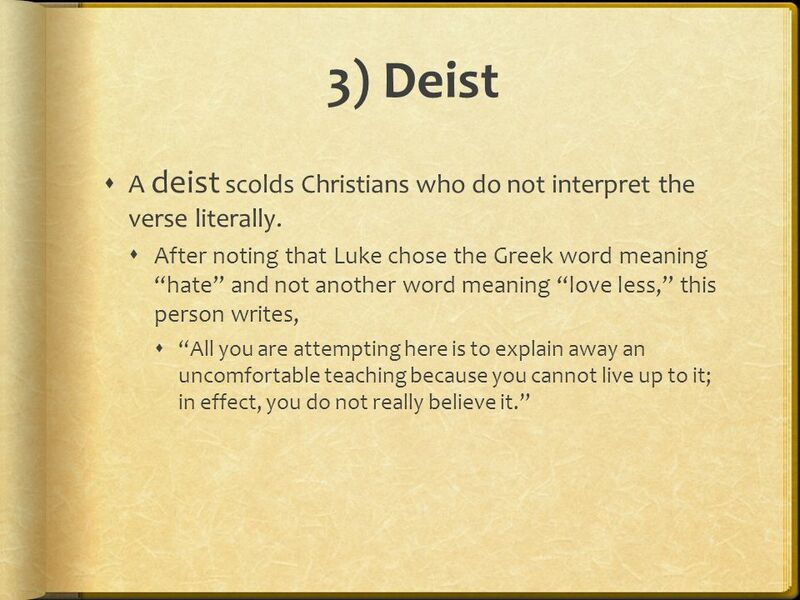 13 3) Deist A deist scolds Christians who do not interpret the verse literally. 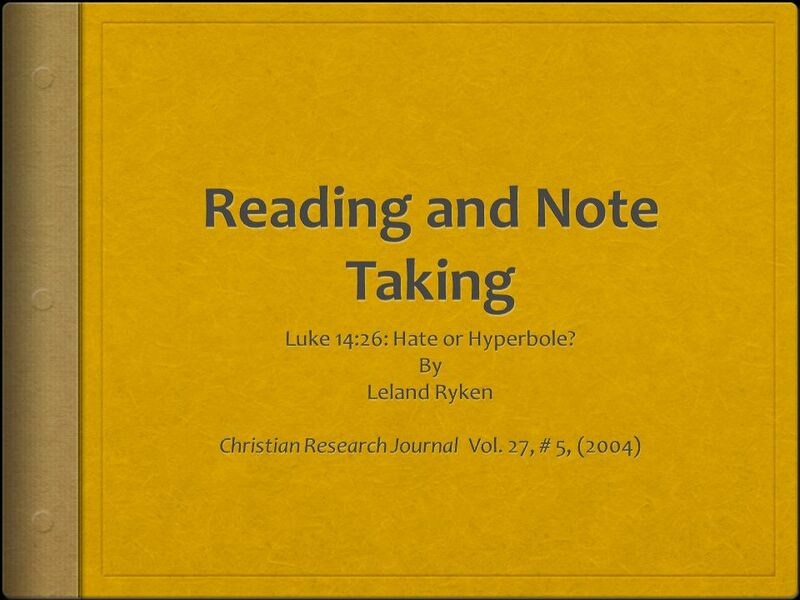 After noting that Luke chose the Greek word meaning hate and not another word meaning love less, this person writes, All you are attempting here is to explain away an uncomfortable teaching because you cannot live up to it; in effect, you do not really believe it. 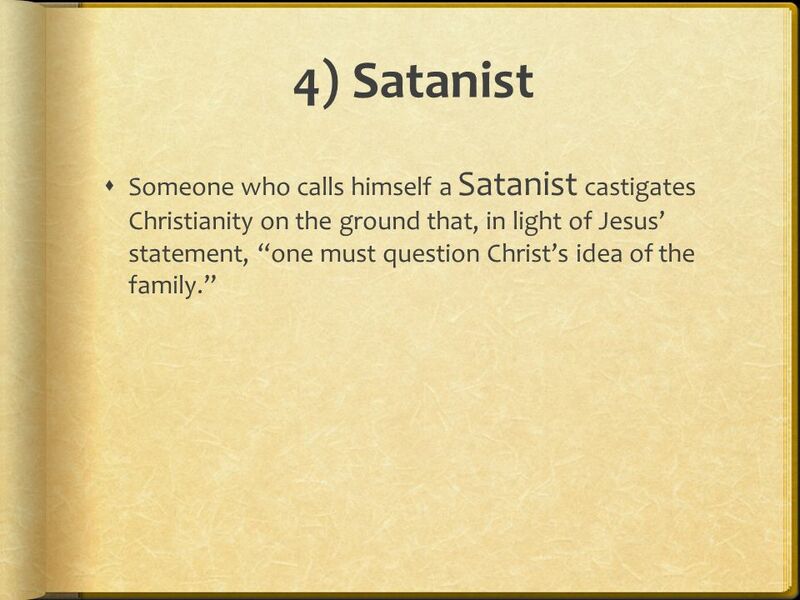 14 4) Satanist Someone who calls himself a Satanist castigates Christianity on the ground that, in light of Jesus statement, one must question Christs idea of the family. 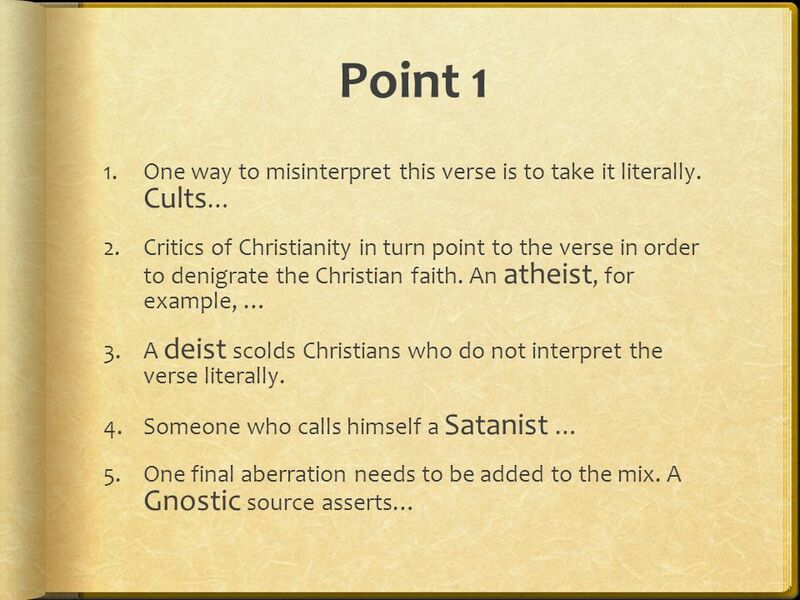 15 5) Gnostic One final aberration needs to be added to the mix. 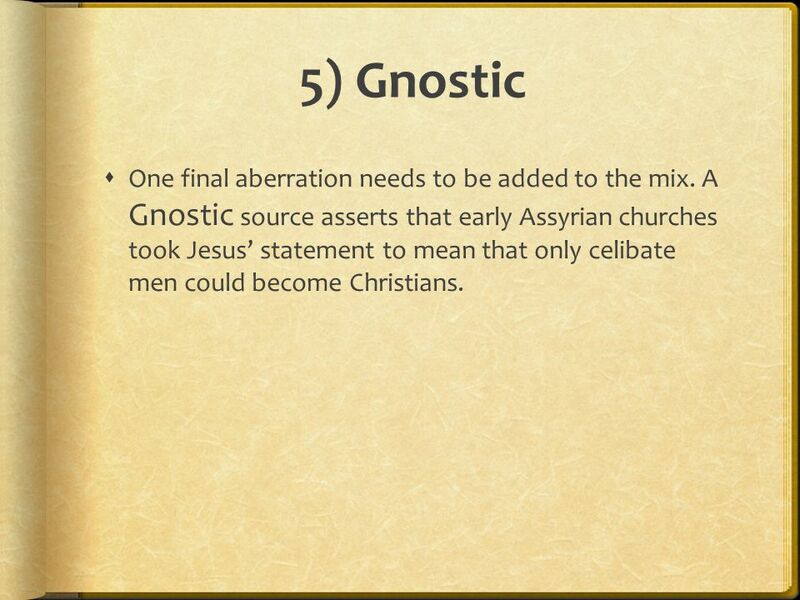 A Gnostic source asserts that early Assyrian churches took Jesus statement to mean that only celibate men could become Christians. 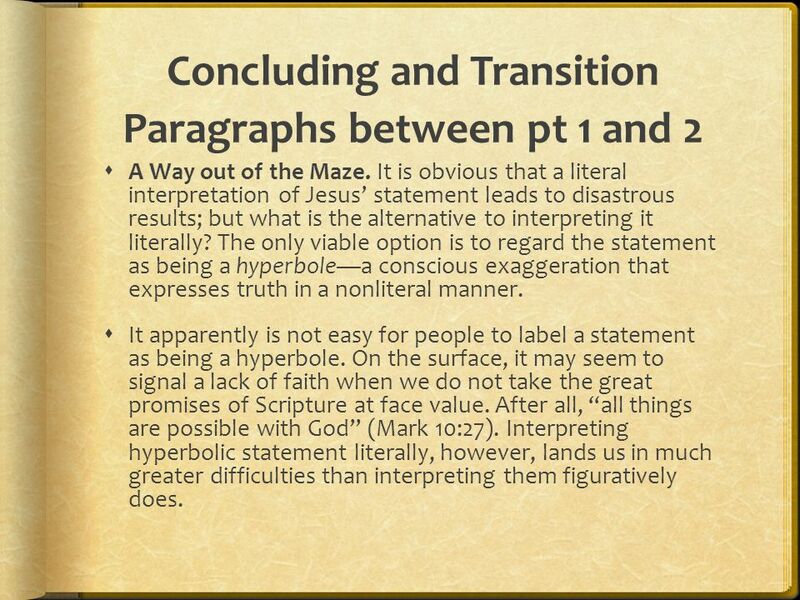 16 Concluding and Transition Paragraphs between pt 1 and 2 A Way out of the Maze. It is obvious that a literal interpretation of Jesus statement leads to disastrous results; but what is the alternative to interpreting it literally? The only viable option is to regard the statement as being a hyperbolea conscious exaggeration that expresses truth in a nonliteral manner. 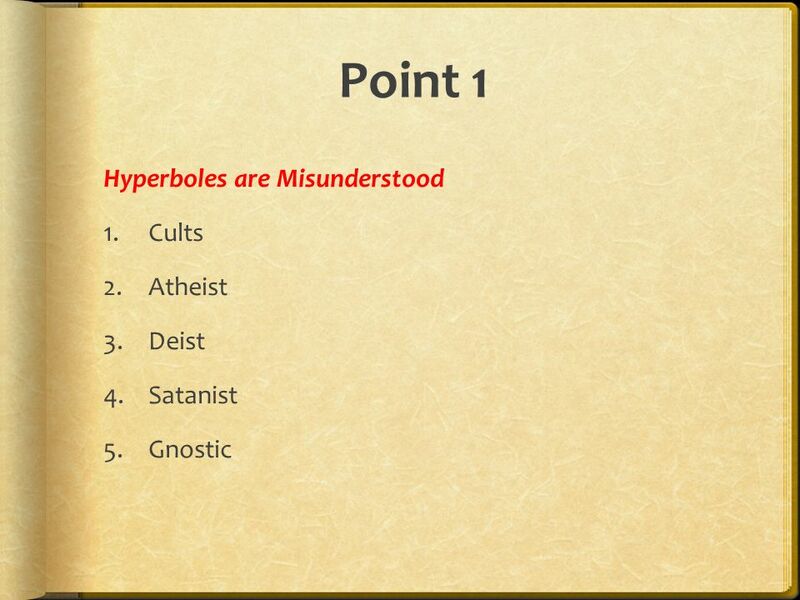 It apparently is not easy for people to label a statement as being a hyperbole. On the surface, it may seem to signal a lack of faith when we do not take the great promises of Scripture at face value. After all, all things are possible with God (Mark 10:27). 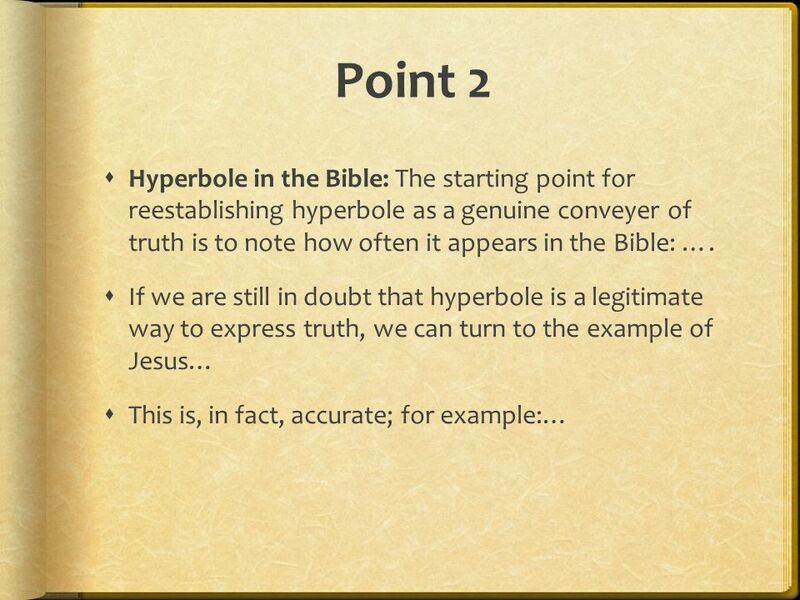 Interpreting hyperbolic statement literally, however, lands us in much greater difficulties than interpreting them figuratively does. 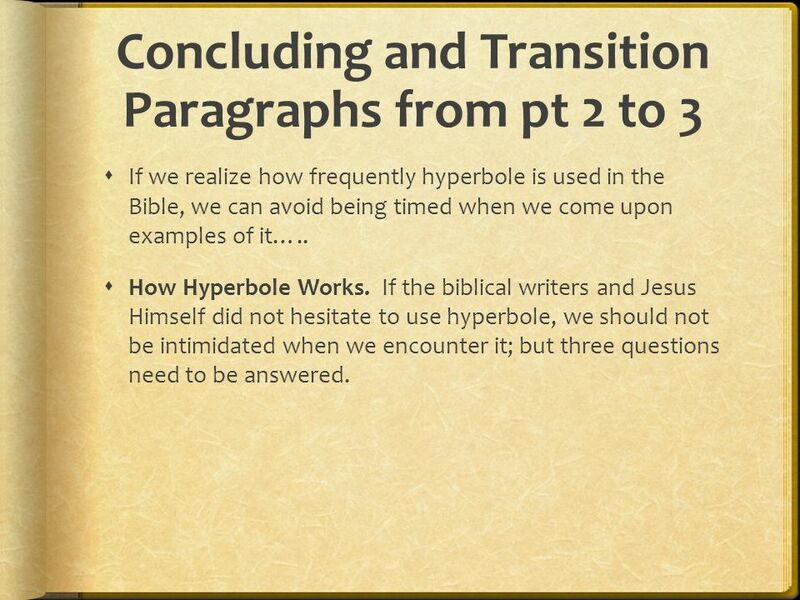 18 Concluding and Transition Paragraphs from pt 2 to 3 If we realize how frequently hyperbole is used in the Bible, we can avoid being timed when we come upon examples of it….. How Hyperbole Works. 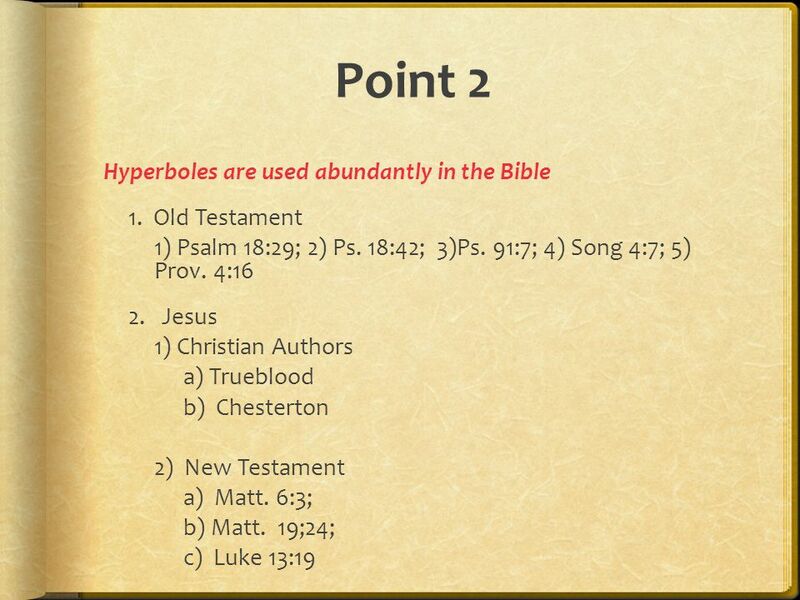 If the biblical writers and Jesus Himself did not hesitate to use hyperbole, we should not be intimidated when we encounter it; but three questions need to be answered. 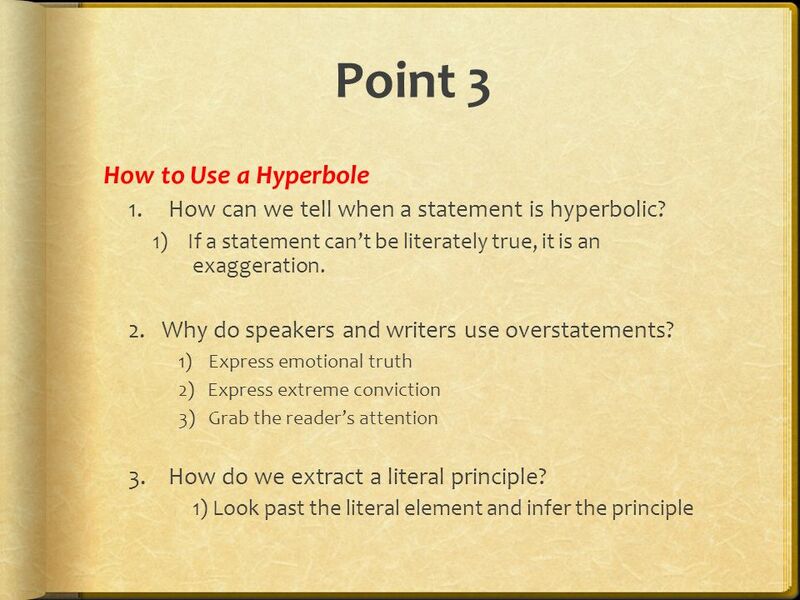 19 Point 3 How can we tell when a statement is hyperbolic? 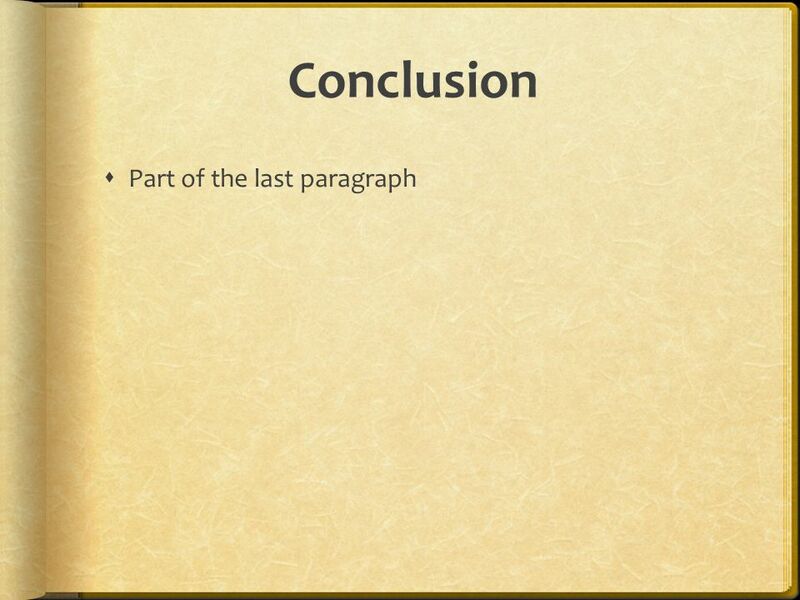 Why do speakers and writers use overstatement? 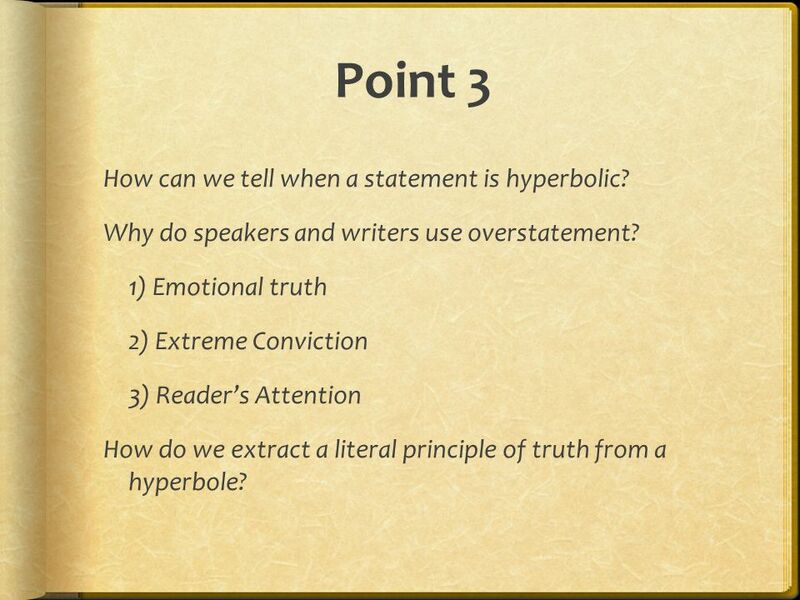 1) Emotional truth 2) Extreme Conviction 3) Readers Attention How do we extract a literal principle of truth from a hyperbole? 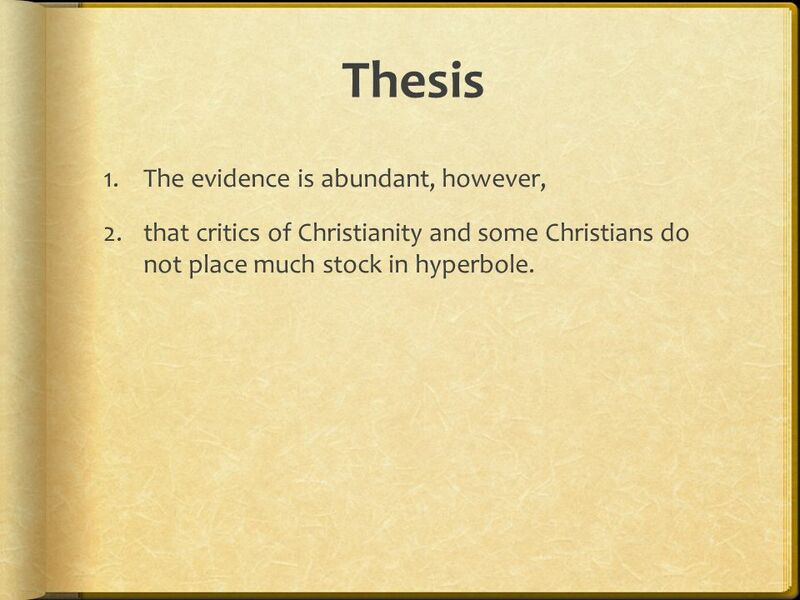 Download ppt "Thesis 1.The evidence is abundant, however, 2.that critics of Christianity and some Christians do not place much stock in hyperbole." F L E S H I NG O U T Y O U R FAITH A STUDY IN HEBREWS L I S T E N U P ! 1:1-8, 14; 2:1-4. Can the Bible make you a success in life? HINDERING THE WORK OF GOD Hindering the work of God means impeding it progress. It is placing a stumbling block in the way of those that are trying to. Design: J.L. Caravias, SJ LETTERS OF JOHN onLOVE. DISCIPLESHIP Luke 14:26-27, 33 If anyone comes to Me and does not hate his father and mother, wife and children, brothers and sisters, yes, and his own.